Every month I get a little surprise in the mail, Cuisine at Home magazine, courtesy of my dearest Lisa who got me a subscription for my birthday last year. I am usually very bad with food magazines, letting them pile up on the bed stand until they become one with the floor...not good. This one is a no fuss-no muss kind of magazine and their dessert recipes are always so mouth watering...it is difficult to resist!! I was wondering why the postman was taking a break by our mailbox and I went to check on things, he was reading my magazine and looked up at me with a big smile on his face. 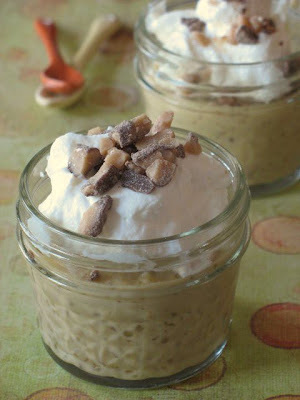 "You have got to make this" he said, pointing at the Toffee-Butterscotch Pudding in the latest edition. I had to agree that it looked mouth watering, and it had two of my favorites Heath Toffee Bar and tapioca. I am addicted to the toffee bar and crumble it up on top of everything lately such as cakes, cookies and my afternoon yogurt. Over the past year I have become quite fond of tapioca puddings, creams and bubble teas, nutritious and filling, it is as versatile as rice for puddings. The recipe was very easy and straightforward, but if course I had to make it richer by adding a small handful of toffee bits inside the pudding. I used the same 8 ounce preserving jars that I used previously for chocolate pots de creme, that way I could take one down to the mailman the next time he came. It's like a sweet surprise as you dig your spoon into it! I don't eat candy that often so this is like a candy addiction to me which is a good thing actually because I am sending this off to Candy Recaper as my entry to Sugar High Friday. Melt the butter in a saucepan on medium heat, add the brown sugar and cook until the sugar melts and starts to foam, about 4 minutes. Slowly whisk in the warm evaporated milk, stirring until smooth. Be careful as it will bubble like mad. Add the tapioca mixture and bring the pudding to a gentle boil. Cook, stirring constantly for an additional 3-4 minutes. Remove form the heat. Stir in the vanilla. Pour half the pudding among 4 serving dishes, divide the toffee bits evenly on top, pour the remaining half of pudding. Cover with plastic wrap, pressing it to the surface as to prevent a ski from forming. Let stand or chill until serving time. Whip the heavy cream to soft peaks with the sugar and garnish the puddings with it. Garnish with more toffee bits. 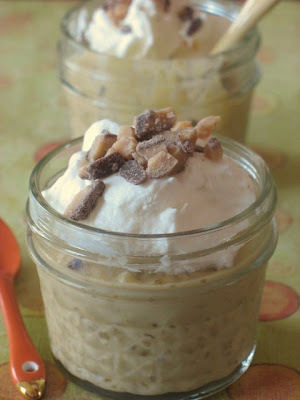 I have been extra hungry for a good homemade butterscotch pudding & seeing your recipe that combines my beloved tapioca & toffee...wow, I know this will work for me! Good choice for the SHF! Your mailman has good taste! I wouldn't mind one of those either. And congrats on winning Artisan Bread in 5 from Jaden... I'm so jealous! I've already made the Nutella Challah that she posted and if that recipe is any indication of what the rest of the book is like, you're going to love it! Another winner! I have been really craving butterscotch pudding lately too. I will have to try this. By the way, come see me. I left something for you on my latest post. That looks amazing. I love all things toffee so I am quite jealous of your mailman right about now. What a nice postman you have! Looks like a really lovely, comforting pudding. Great choice and beautifully presented! Now that's when I lust after the postman's job!! I really have got to try this as Gorn & I both love tapioca (and maybe we like heath bars a little) even with all your rich stuff in there. I too have a mailman who's always asking about what I'm cooking. When we first moved to this house and he saw all of the cooking magazines arriving in my mailbox, he asked me what I do. When I told him, he began to give me all sorts of recipe ideas and restaurant recommendations! Your so nice to have treats for the mailman! Butterscotch is sounding good right now. Very creative what you did for this event. I was stumped to incorporate a candy into a already sweet dessert. But this sounds lovely. That is a beautiful pudding. I like tapioca, but I know some people are weird about the texture. My mom used to pack me those little pudding cups in my lunch for school. The serendipity of life continues to amaze me - Cuisine at Home is one of my favorite magazines, and I just made some Salmon Cakes (fantastic) from 2003 issue. And I'm addicted to toffee, and recently made some blondies with toffee bits in them. Well, some toffee made it into the blondies! I will have to try this tapioca recipe ASAP! I saw this and just had to make it last night. It. Was. Awesome! Thanks so much for sharing! Cheeky mailman ;) Delicious pudding! Your mailman will be very happy receiving this. The pudding looks great. I love the idea of using the perserve jars, I have tons of them and would have never thought of that! I was just peering at my unused tapioca and heath bits on top of my fridge this morning thinking, hmm, how can I use those together! Seeing this recipe on your lovely blog makes me wonder if there's some telekinesis in the air -- thanks for the great post; I'll surely be making this soon! I love tapioca pudding. I miss it so much , I don't know why I don't try to make it. this looks utterly delicious! If i had a toffee bar i would even crumble it on steak... Okay maybe not but that's how much i love the stuff! So gorgeous - I have been craving pudding lately (unusual for me), and butterscotch is next on my list of flavors to try. this look so nice! yum yum yummy! feel like liking it! I love pudding! 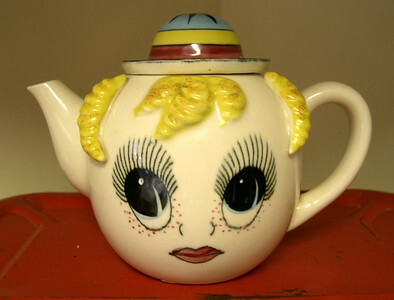 It reminds me of my childhood days, too bad mine never looked as good as this!! WOW, this does look like something that I MUST try! what a super idea--those little mason jars are perfect for portable pot de creme! Instant 'yes'! Looks amazing, Helen. Oh, my, these are divine. So cute in the little canning jars! I'll bet you never have a problem with getting the wrong mail when you treat your mailman so well. Toffee AND butterscotch?!?!! Helen, you spoil me with your tantalizing flavor combinations!! such a lovely, decadent combination for this latest dessert of yours!! I too get Cuisine at Home, well, at home (haha) in the mail!! I love it!! advice from the mail man I love it! SO this new blogger needs some advice... I am posting an entry for SHF and was wondering how... it seems like you just post it on your blog whenever you're ready and then send in the link and your info by the deadline? Some direction would be most helpful. Thanks! oh brother, does that look amazing!! i am a sucker for butterscotch, and i bet your postman was psyched! I'm not a tapioca fan, but I'm sure that this would convert me! What a delicious pudding...I can only imagine how wonderful that is. oh my! i love toffee! i am going to have to try this! I love Heath bars, so this is right up my alley. I can only assume that your mailman does everything he can to make sure you receive your mail on time and in good condition -- what an incentive! I'm glad the round-up is out because I missed this. I love it that your postman is involved in your cooking life! Amazing-looking pudding! I made this delicious pudding tonight and it was a hit with my family. 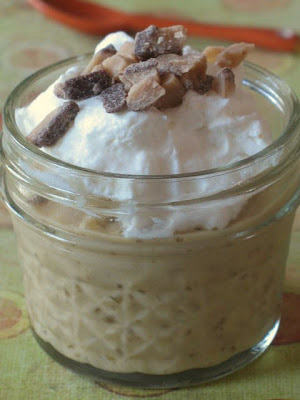 The tapioca and Heath bar added a whole different dimension to regular ol' butterscotch pudding. Thanks for sharing the recipe! !